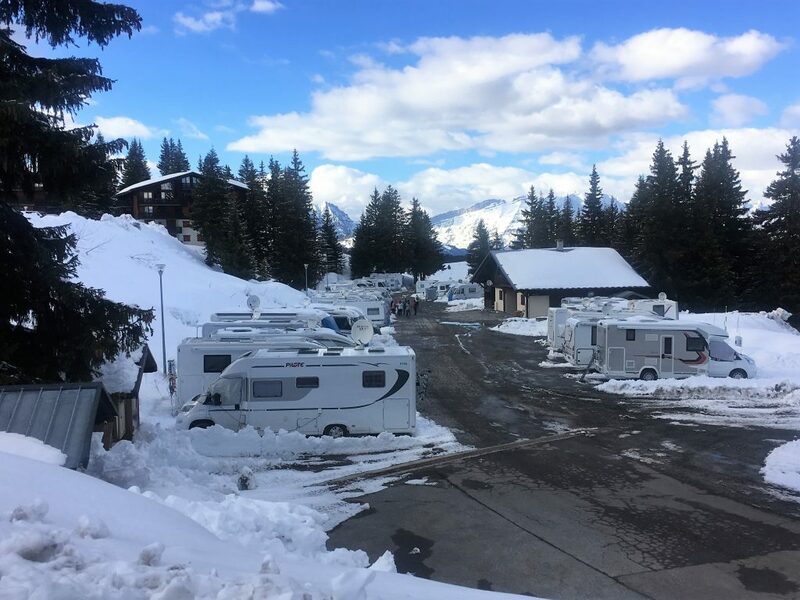 We packed ourselves up and said goodbye to Camping Montchavin, we really liked the campsite but hadn’t been so enthralled by the skiing at La Plagne, it was time to find somewhere new. We were also feeling that we were getting too comfortable in campsites – it was time to go back to aires and parking spots. However we weren’t going to immediately throw ourselves back into an off grid existence. We wanted a soft option as the weather forecast for the next few days was unusually cold (for this year anyway) so we were off to an aire with electricity. Not only that but it could be booked online and so we had paid the additional €2 to book our space. We really have gone soft. There was a light dusting of new snow on the fields and trees as we drove away, giving the scenery a fairy tale feeling. 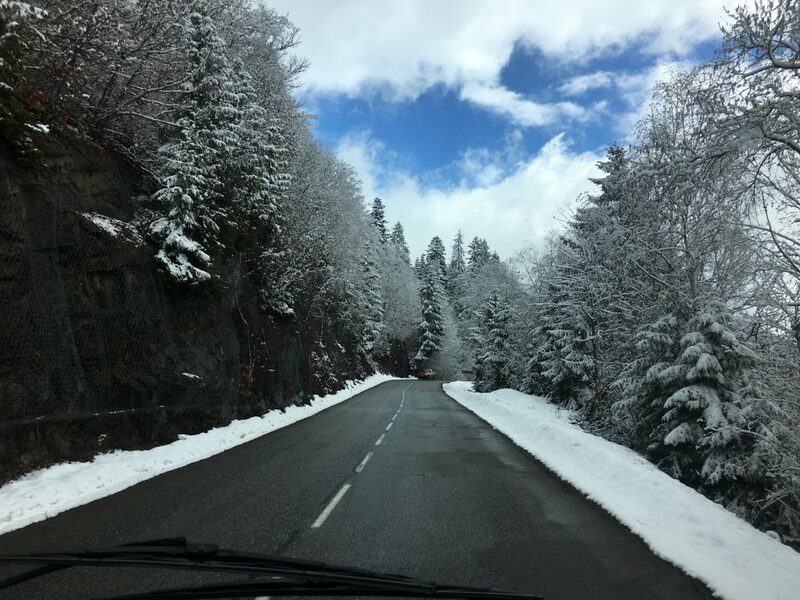 The roads were quiet and the drive was pretty uneventful – it wasn’t long before we found ourselves in Les Saisies, a little higher than our previous campsite and a lot more snowy. Our arrival at the aire coincided with two other French vans and we found ourselves at the back of the queue waiting to get in. The amount of time and discussion it took to open the barrier started to worry us. It was the same make of ticket machine as the one at Vaujany where we had been stranded outside the aire for a night. This time we sailed through in just a few minutes, I don’t know what had been the problem for the French vans, maybe they were just having a highly engaging conversation about something else. Once in and parked up comfortably (we managed to find a recently vacated spot and didn’t have to get the shovel out) we wrapped up warm and went for a wander to suss out the location. We were right on the slopes but a little way from the town. The snow on the slopes was soft and powdery so we took the bus into Les Saisies for a look around. The whole town is very cow and dairy oriented (where in the Alps isn’t?) so there are plenty of opportunities for dairy delights. Once we had our bearings we indulged in two long days of skiing while the temperatures were below freezing. On the afternoon of the second day the sun was starting to warm things up again and we had some interestingly slushy moments but this didn’t stop us enjoying the variety that the pistes have to offer in Les Saisies. It might be our favourite resort so far, it definitely got us over our La Plagne disappointment. For our final day we had a walk on the well groomed pietons tracks over the slopes before heading to the pool for a soak. It was so warm on the slopes that we were down to our t-shirts while going uphill. After a swim we indulged ourselves with a trip to La Chocolatine, a bakery, patisserie, chocolatier and café. Our favourite find was their baguette made with Beaufort cheese, yummy. 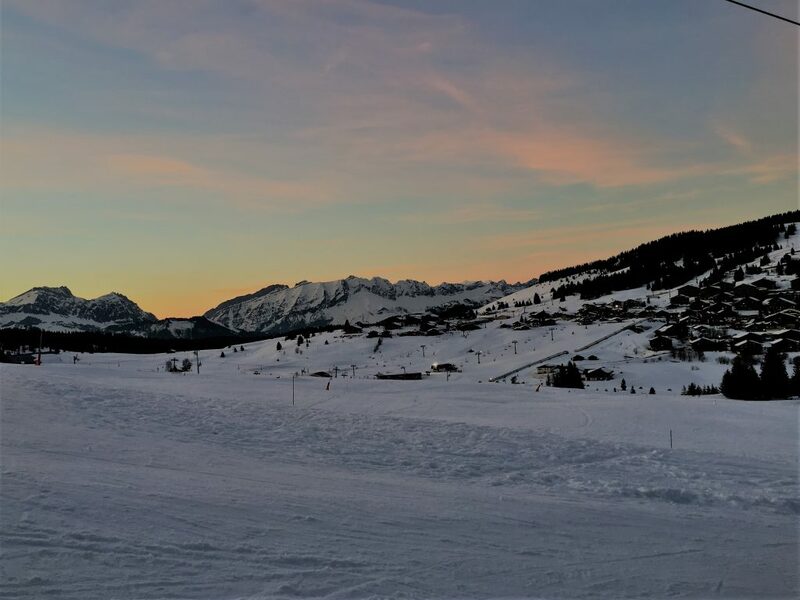 That evening we had a twilight walk on the pistes, narrowly escaping being mown down by groups of people on sledges – it’s a good job they make lots of excited whooping noises on their way down otherwise we may not have managed to avoid them. The previous night had been the super moon, Paul had seen it rising over the mountains but forgotten to say anything to me, so this evening we were hoping to get some photos. Sadly (it’s all Paul’s fault) we had missed our opportunity. Les Saisies is very motorhome friendly. We spotted three different motorhome parking areas and I’m sure there are more nooks and crannies you can find. Grand Tetras Aire: This is the aire we stayed at. It is operated by IPARK and you can book it online. 10amp electricity is available for all pitches although you might need a very long lead. The aire is right on the slopes in a true ski-in ski-out location, the best we have stayed in so far. It used to be the local campsite but the facilities building – where you can see tantalising glimpses of toilets and showers – is locked up; only waste disposal and water are available. You get a code when you book (or when you arrive, if you haven’t booked) at the aire and you need this to access the waste and water, although most people just leave it open to avoid the hassle. When the snow melts here the ground can get quite mushy, it’s a combination of rough asphalt and dirt parking, we took care to ensure our drive wheels were on firmer ground. The cost is €19 per 24 hours plus tourist tax, you pay in advance when you arrive (credit/debit cards only), but can extend your stay at the machine. ‘Parking Col des Saisies’: Opposite Le Signal sports centre on the opposite side of town to the Grand Tetras aire there is a large motorhome parking area. It is next to the coach parking and is paid – we didn’t look at the prices but anecdotally it is about half the price of the Grand Tetras aire. Services are provided via a Flot Bleu (in the coach parking) which costs an additional €2. 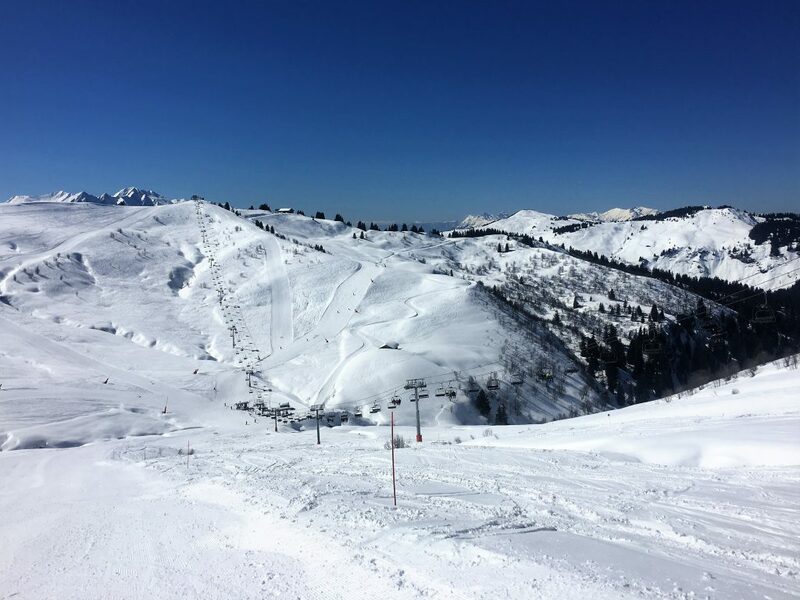 It’s a short walk to the slopes and a short walk to Les Saisies town. All the parking here is on asphalt. Off grid parking above the Grand Tetras Aire: On the corner of the road above the Grand Tetras aire is an area of parking that holds about a dozen vans. There are no parking restrictions and it was being well used while we were staying. Outside the Grand Tetras aire (by the bins) is a Flot Bleu (€2) which can be accessed by anyone for services although there is no drive over grey waste disposal. There is a small supermarket in Les Saisies which we didn’t need to use but I imagine is as pricey as usual. There are a number of bakeries including the excellent La Chocolatine. The sports centre at Le Signal includes a pool and spa complex. Use of the pool alone costs €8.50, and the pool has a few added extras like bubble jets and a short lazy river. The pool is just about big enough to swim, although it’s curves make it a bit of an odd experience. There is a single straight lane for serious swimming but realistically no more than two or three very polite people could use it. The ‘Bien Etre’ (‘well-being’) spa complex costs extra for sauna, steam room and jacuzzi. There is also bowling here. A laundrette is available in Les Saisies but we didn’t use it. You can walk out the far end of the Grand Tetras aire and be on a ski run, you will see a chairlift overhead which is the Les Carrets lift. A lift pass office is situated at the bottom of the Les Carrets lift and you can ski down to buy your ticket. At the end of the day (and for lunch) you can ski back to the aire, taking your skis off at your motorhome door (if it’s snowy enough). There is a free bus that runs past the entrance to the campsite and around Les Saisies all the way to Le Signal, it connects with another bus that goes to the parking at Bisanne. Les Saisies is part of the wide Espace Diamant ski area. Les Saisies covers the highest points of the ski area and due to the temperatures we decided not to get a ski pass for the wider area. It took us two longish days to ski all of the area (apart from a very lumpy black run and a couple of lower slushy sections). In all it’s a good varied area and it’s only downside is the predominance of slow old lifts (you know the type – they seem too fast when picking you up and too slow once you’re on them). The Les Saisies ski area splits into two with the resort town sitting between. The smaller Bisanne half (on the same side as the Grand Tetras aire) rises to 1940m and has a selection of gentle blue and green runs that feed into Les Saisies as well as some more exciting short red and black runs under the Chamois lift that maintain good conditions even in warm weather. We had fun on the ‘expert’ run on this side – a ski-cross run next to the Palette drag lift that has some excitingly steep sections and stomach dropping rollers. 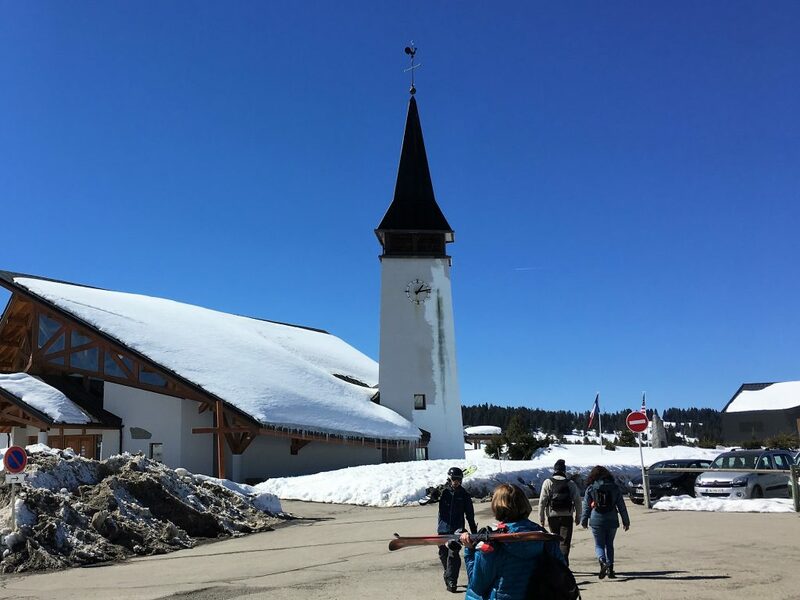 The larger half is gained by ascending the Chard de Buerre lift and reaches a height of 2069m – the highest point in the area. You can descend to Hauteluce village (1150m) from this side but it was far too slushy when we tried. Otherwise there are a selection of nice runs up here including a black that was too much for us – very lumpy – i’s probably the only really difficult run in the area. Up here there is also a lot of nice off piste skiing. The lift pass for Les Saisies is a very reasonable €36 per day whereas the Espace Diamant day pass is €41. You can get 4 hour passes or even 2 hour passes for Les Saisies. It’s nice to have this much choice. There are groomed walking routes all over the pistes. 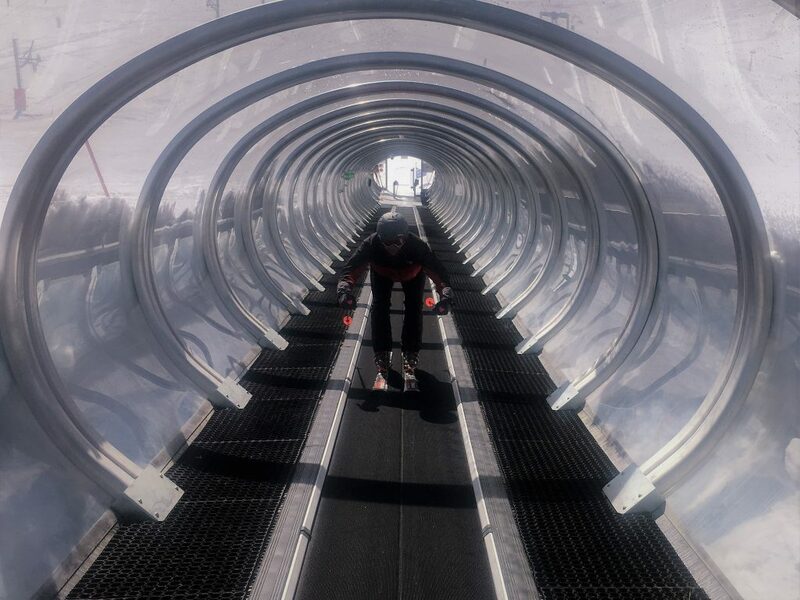 This is a great feature of the resort and works remarkably well with the ski routes. You can pick up one such path across the slopes from the Grand Tetras aire to the town, as well as getting up to the peak of Bisanne. For getting higher and further a Pieton’s pass is available. There are non groomed snowshoe routes all over the area signposted with purple signs. Route maps can be found on information boards and in the tourist office. Lovely read about a resort we stayed in last March although only OH skied (twisted knee). I wish we had more time to explore the resort then – missed out on the relax in the pool bit! Thank you, we’ve got this on our list of places to go back to in a year with better snow (or earlier in the season). I remember twisting my knee the second year I went skiing – so frustrating!